The 1990s graced us with many wonderful things, including an array of songs that still remain fixtures on our playlists today. While there were several hits we could belt proudly in a crowded room, several were relegated to the confines of our bedrooms, in the shower (when no one was home, of course), and during solitary drives with the windows rolled up. The instant a new boy band smash, bubble gum pop track, or pulsing dance jam would hit the radio airwaves, the same derisive commentary seemed to follow about how the songs were "so annoying" and "played out." I would always offer a sheepish giggle and pretend to agree while secretly anticipating the next time I could scurry into seclusion and satiate my need for some ridiculous ear candy. In 2015, several of these certified guilty pleasures still remain a fixture within the privacy of my earbuds. One of my friends recently asked me what I was listening to and I responded with chagrin that it was "Everybody (Backstreet's Back)" by the Backstreet Boys. Rather than look horrified, her face broke into an exuberant grin. "I love that song! BSB for life, am I right?" She was right, and the following are several of the 90s songs we told everyone we hated but secretly loved. Will Smith, "Gettin' Jiggy Wit It"
Excuse me while I close my bedroom door, draw the blinds, and have a dance-off with myself. As an avid fan of BSB — and boy bands in general — this is still one of my go-to workout jams. All I really, really want is to play this song all day, everyday. Mandy Moore may be "so addicted" to the love she's gleaning from the male model starring in this video, but all I'm addicted to is this song's infectious beat. No, I'm never going to be able to look at Barbie dolls the same way after hearing this song; I'm also never going to be able to stop listening to it. 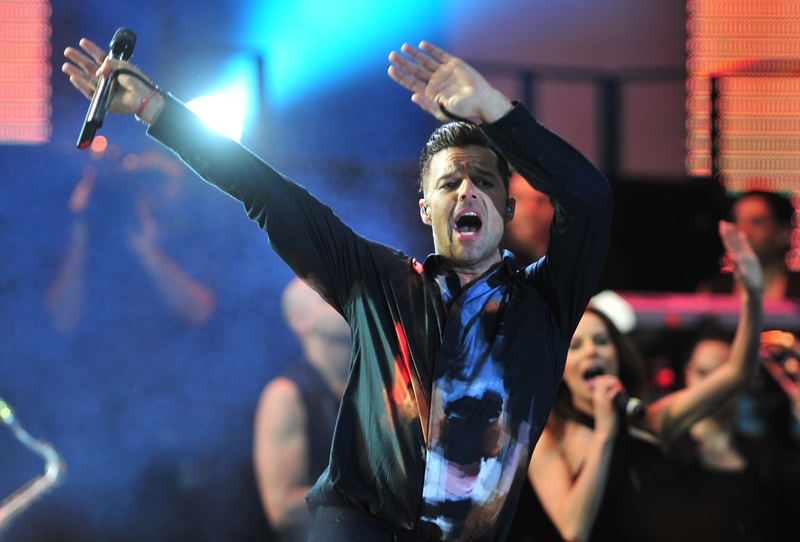 Ricky Martin, "Livin La Vida Loca"
You just made a completely accurate statement. Please stop going through my iTunes. Jordan Knight, "Give It To You"
In 1999, former New Kids on the Block member, Jordan Knight, proved that he could still pull off a ribbed turtleneck and dance moves without the help of his four NKOTB bandmates with this addictive track. "Mmmbop" isn't an actual word, but our secret undying love for this song couldn't be more real. I exhausted myself pretending to not be completely obsessed with this track in 1997. In 1994, there was nary a middle or high school dance that failed to feature this song and spur an entire auditorium of students into synchronized "Macarena" moves. Quad City Dj's, "C'mon N' Ride It (The Train)"
Just as the fervor from the "Macarena" dimmed, Quad City Dj's offered a new dance anthem to become addicted to. Jessica Simpson, "I Think I'm In Love"
Not wearing a seatbelt and standing up in the passenger seat of your friend's jeep while belting out this song aren't two practices I'd recommend. Conversely, I would recommend listening to this song on a daily basis. Yes, LFO, New Kids on the Block certainly did have a lot of hits — but what does that have to do with Chinese food making you sick and liking girls who wear Abercrombie & Fitch? Come to think of it, I don't really care as long as I can jam out to this song forever. If the music video for this song has taught us anything, it's that even extraterrestrials on a space mission can't resist bopping their heads to this beat. During a time when boybands and platinum blonde bubblegum pop reigned supreme, this song was a fixture on Top40 radio — and in our earbuds. Lou Bega, "Mambo No. 5 (A Little Bit of...)"
Swing dancing made a comeback in the late 90s, and this song was the perfect accompaniment when kicking up your heels. Bega may want "a little bit of" so-and-so, but I want a lot of this song in my ears while practicing my dance moves. Don't even try to deny it: We all had a pair of parachute pants relegated to the back of the closet for times we wanted to secretly try and master these moves in our bedrooms. You're right if you feel that this song is ridiculous — ridiculously awesome, that is! And, yes, I do in fact "do my little turn" on an imaginary catwalk while listening to it. One of our most beloved Saturday Night Live sketches and subsequent movies, Night at the Roxbury, wouldn't have been the same without this song. I knew I had really "blown it" when friends walked in on me completely jamming out to this song after pretending I found it "super annoying." 98 Degrees, "Because Of You"
I didn't realize how in need I was of a Nick Lachey fix until revisiting this song and music video. In the music video for this 1998 track, Lachey and the boys of 98 Degrees are seen looking longingly into the camera (i.e., my eyes) while belting from within billboards, on the top of a bridge, and even in a field of daisies! Seriously, what more could you ask for?